Get an edge on your competition by offering the Auto$mart driver-training program. This course comes packaged in four learning modules. They provide key information about how driving affects the environment, how to drive more efficiently and how to buy a first car. The fourth module is a review of what your students have learned. Instructor's Guide – Sets out lesson modules that focus on buying, driving and maintaining a vehicle for fuel efficiency. Explains how to include this information in your existing in-class driver education program. Student Workbook, Instructor's version – Allows you to stay “on the same page” as your students throughout the lesson by ensuring that the answers to every question are at your fingertips. Student Workbook – Contains engaging exercises, additional information and free space to allow students to personalize their workbook. 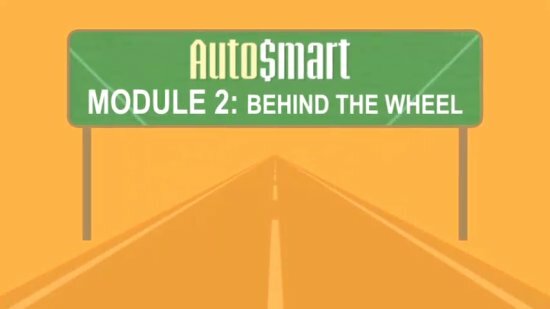 Video – In addition to a video tailored to each of the four learning modules, the package contains an introductory video called Auto$mart Welcome. CD-ROM – All of the kit's print and video materials, additional links and other resources are stored in a single, convenient electronic format. Carbon dioxide (CO2) is essential for all life on the planet. Without it, the average temperature on Earth would plummet by 33°C, creating an environment too cold for most species to survive. But too much CO2 is just as dangerous and the average Canadian vehicle releases more than four tonnes of it, roughly the weight of eight full-grown dairy cows, every year. Find out how the vehicles we drive contribute to climate change – and what you can do behind the wheel to minimize your impact. In Canada, we own about 20 million vehicles and drive more than 300 billion kilometres each year. Understanding the relationship between driving and the environment is about some basic concepts. And a couple of important strategies you can use right now. What we’re going to talk about is, quite simply, driving like the future depends on it. Because, it does. A car/truck/minivan/SUV/motorbike/scooter is a wonderful thing. It’s about freedom. Independence. Mobility. Adventure. But there’s a problem. All vehicles create greenhouse gas emissions that are very harmful to our environment. Here’s the simple equation. A vehicle produces about 2.3 kilograms of CO2 for every litre of gasoline it burns. The average vehicle in Canada produces 3 times its weight in CO2 every year. For a 1,400 kg car, that’s 4,200 kg of CO2. Multiply that by 20 million vehicles, and you’ll see that, together, we’re generating large amounts of greenhouse gas emissions, that may be disastrous to life on Earth. But we can cut down the greenhouse gases our cars spew into the environment. It’s about driving like the future depends on it. And that’s where Park It and Plan It come into play. Got it? OK, awesome. Here’s point 3. Hang up Your Keys: Just because you have a vehicle doesn’t mean you need it to be your only mode of transportation. Walk, bike, skateboard, carpool, take the bus or subway or train. Look around you next time you use public transit. Each bus or subway car can represent 40 or more cars not on the road, not producing greenhouse gas. Pretty cool. In some places in Canada, you can also kayak, skate, or even ski to work or school. Try it. Take a look at your life: You know, there are alternatives to grabbing your keys and driving. Consider tele-working if you can. Use conference calling or video meeting software and save lots of people from doing lots of unnecessary travel. Consider taking one or two of your courses on the web. Look at being more physically active and building part of your social life around that – at the rink, on the bike and running trails – use your imagination to find ways to have fun that don’t involve the car. Simple, isn’t it? And if you want to drive (or in this case, not drive) like the future depends on it, take these suggestions and work them into your life. Now. Still with us? OK, on to point 4. Once upon a time, Denise called Bob and Mustapha and Alexis, saying that she was planning to head to the mall and the food market in her spiffy new car and wanted to make the trip environmentally worthwhile. Bob tweeted “Awesome – I need hockey tape and broccoli, count me in!” Mustapha texted “I am so there – and I’m in for a spatula and some paprika. I’ll shoot you traffic reports and construction notices so we don’t waste any time.” Alexis SMS’ed “I have cool new map software so I can plan the route, besides I need bok choy and a squash racket.” Denise texted/tweeted, and emailed everyone, who agreed to meet at Alexis’ place. And off they went, saving the planet, driving like the future depended on it. The moral of the story? Plan your trip, avoid backtracking or inefficient routes, combine several trips or errands into one, watch for slowdowns and snags, and drive intelligently. This module teaches drivers how to cut their fuel consumption, and costs, by up to 25% with 5 easy fuel-efficient driving techniques. Learn the tips and tricks of driving efficiently and safely. Yep. It’s called the accelerator, or the gas pedal. But you might want to think of it as… the money pedal. See, every time you push this pedal hard… it costs you money. Fuel money. Because accelerating hard might be sort of fun but it can use up to 15% more fuel and that, my friends, is what they mean by false economy. And when you take your foot off the money pedal, you pretty much need to put your foot on the brakes. The harder you have to brake, the more money it costs you, too. Ka-ching! Tires, brake shoes, pads, rotors, drums, suspension parts like shocks, springs, tie rod ends, ball joints, wheel bearings. Sound expensive? It is. So easy on the gas when starting up from a standing stopped position is more than just environmental responsibility. Gentle acceleration is… well… money in the bank. All right, let’s move on, on to point 2. Hey, we all know people who are “all over the place”. And they drive us nuts because they seem so… inefficient. Well, having your speed all over the place is kind of like these people… inefficient. First, it’s hard for those following you to judge distance and avoid negative interaction with you, as in… hitting you. Second, it’s unbelievably inefficient for your wallet. Your engine is revving unnecessarily; you’re on and off the brakes, causing wear on pads, rotors, shoes and drums; you’re constantly upshifting and downshifting, putting unnecessary stress on your transmission and driveline… not to mention the fact that you’re stressing yourself out for no good reason. Third, and most important, driving at a steady speed saves money on fuel, and is easier on the environment because you're burning less fuel… and putting fewer pollutants out your exhaust. When you keep your speed even, you maximize your vehicle’s ability to use all the things that make it fuel-efficient: everything from aerodynamics to efficient engines to great helpers like cruise control. So get a rhythm going. Get a beat. Catch that groove. Drive steady, real steady. And listen to the sound… of money in the bank. Got it? OK, awesome – here’s point 3. Hi. Today, I’m going to give you an amazing deal. I’m going to give you just one tip that could reduce your fuel consumption by 20% on the highway. No strings attached. Yep. 20%. All you have to do… is be smart. Let me explain. On the highway, simply slowing down from 120 km/h to 100 km/h saves you 20% on fuel. A wonderful bonus when you consider that there are a lot of other reasons why driving at high speeds is just, basically, a very bad deal. It is generally very, very illegal to drive over the speed limit, and the faster you go, the more certain you’ll be saying goodbye to car keys, license, vehicle, and any kind of affordable insurance rates. But there’s another way to think about it, too. Remember we talked about “the money pedal”? Well, you're pouring fuel through your car’s engine at a huge rate when you speed, especially because, today, cars are set up to be most efficient between 50 and 80 km per hour. Here’s the bottom line. By not speeding and by adopting the other fuel-efficient driving techniques, the average Canadian driver, that’s you, can keep $500 in his or her pocket every year (right, your pocket), and reduce vehicle wear and tear, and greenhouse gases and other nasty emissions which compromise our environment. So, use your head, and your skills. Keep the speed down, for all kinds of good reasons. It’s safer, makes more sense and… it’s money in the bank. You can predict the future! You can be master of time, space, and dimension! All these things can tell you key things like whether to gradually slow down, whether to change lanes well in advance, whether to accelerate or maintain your current speed. And all this is possible because you focus on the future – seconds or minutes in front of you… and metres or kilometres in front of you. It’s a skill you can learn and master. Your anticipation saves you stress, saves wear and tear on all the running parts of your vehicle, and saves you from using fuel unnecessarily. Simple. Money in the bank. We’re in the home stretch – now on to point 5. One of the hardest things to do behind the wheel is… well… nothing. But doing nothing can save you money, can make your vehicle last longer, and can help the environment, too. Let’s talk about it. Usually when you drive, you’re either accelerating, maintaining current speed, or braking in order to get to a standing stop again, right? But there’s one other technique, and that technique is called coasting. Remember when you were young and had your first bike? You’d pedal like mad… then you’d get tired… and you’d coast. You’d let your body rest until it was time to go fast again. When you coasted, you gradually lost speed because of wind resistance and friction. With a vehicle, coasting means you plan the phases of each segment you drive, whether it’s a block or a few hundred kilometres. You maintain your speed, with small adjustments. When you know you will be stopping in the future, you coast, allowing the vehicle to slow down. Then, you brake. And you’ll find that you brake less because you’ve slowed down by coasting. Most vehicles today are equipped with fuel-injection systems that automatically shut off fuel to the engine when the accelerator is released. So coasting – doing nothing – means you’re employing good thinking and driving skills, and using the technology to help you save fuel. Do you hear that sound? It’s the sound of coasting. The sound of nothing… except money in the bank. Learn how to save money, and the environment, by finding the right fuel-efficient vehicle. Check out Natural Resources Canada’s fuel consumption ratings search tool. It will give you the fuel consumption ratings, CO2 emissions and estimated annual fuel costs for light-duty vehicles sold in Canada. Learn about how to shop for the fuel-efficient vehicle that’s best for your lifestyle. This module is the driving tune-up. It reviews all the lessons you’ve learned in your Auto$mart training. Here it comes. The day you get the keys. Keys to your freedom. Keys to your future. Keys that are all about privilege and all about some pretty significant responsibility. But have you earned them? Are you a skilled, knowledgeable, and environmentally responsible driver? A 1,400 kg car produces about 4,200 kg of CO2 per year. If you multiply that by 20 million vehicles it creates a staggering impact on a planet that is trying its best just to survive. It’s all about being aware of the negative environmental consequences of driving. And taking a close look at options like walking, biking, skateboarding, carpooling, taking public transit. You can make choices that allow you to hang up those keys sometimes and explore the alternatives. As you face your future as an environmentally responsible and highly skilled new driver, remember to examine alternative ways of living and working, things like tele-working, conference calling or taking courses on the web. Remember, too, how important it is to plan every trip, to avoid backtracking or inefficient routes, to combine several trips or errands into one, to watch for slowdowns and snags. Because planning can save you money and save the environment as well. You can also take a very close look at some driving techniques that will help you be more gentle to Mother Earth, your vehicle, and your pocketbook as well. Let’s review some of these techniques now. First: Avoid jackrabbit starts at all costs. Think of the accelerator as the money pedal, always use it gently, efficiently. Second: Maintain a steady speed, because it maximizes your vehicle’s ability to use all the things that make it fuel-efficient. Varying your speed unnecessarily uses more fuel and increases wear and tear since you’re on and off the brakes. The wear is on tires, brake pads, rotors, shoes and drums, and you’re putting unnecessary stress on your transmission and driveline… not to mention the fact that you’re stressing yourself out needlessly. Third: Avoid high speeds. On the highway, simply slowing down from 120 km/h to 100 saves you 20% on fuel. You can also take advantage of the way today’s vehicles are made, because today, they operate most efficiently between 50 and 80 km per hour. It is illegal to drive over the speed limit, and at the very least, the tickets and impact on insurance rates can be very, very significant. So just remember that reducing your speed by 20 km per hour saves 20% on fuel. And reduces vehicle wear and tear. And reduces greenhouse gas and other nasty emissions which compromise our environment. All these things can give you key information, like whether to gradually slow down, whether to change lanes well in advance, whether to accelerate or maintain your current speed. And all this is possible because you focus on the future – seconds or minutes in front of you, and metres or kilometres in front of you. What does this accomplish? It lowers stress, saves wear and tear on all the running parts of your vehicle, and saves you from using fuel unnecessarily. Fifth: Here’s the final driving skill. The fine art of doing nothing, of coasting. Coasting means you plan the phases of each segment you drive, whether it’s a block or a few hundred kilometres. Then you brake. And you’ll find that you brake less because you’ve slowed down by coasting. Most vehicles today are equipped with fuel-injection systems that automatically shut off fuel to the engine when the accelerator is released. So coasting means you’re employing good thinking and driving skills – and saving fuel. So now you’ve learned about the environment, and you’ve learned a lot about driving techniques that can put as much as $500 in your pocket every year. But there’s more. Here are some essential steps that will help you become an astute buyer or leaser of vehicles. Answering these questions will ensure you buy a vehicle that meets your everday needs. It’s also important to choose the right type of motive power. Hybrids combine electric power with a gasoline or diesel engine, have low fuel consumption; these vehicles automatically shut off when you are idling and restart when you are ready to go, which adds to their efficiency. These vehicles are so smart that you never have to worry about the battery running out! There’s a wealth of choices for you, that will allow you to choose the style, size, and engine type that makes the best sense for you. Think light. Think small. Think efficient. Choose the vehicle that meets your everyday needs as opposed to buying something that you may need only once in a while. Remember also to read the labels – the EnerGuide labels, the “fine print” – and helpful web sites like vehicles.nrcan.gc.ca. Look for vehicles with the lowest fuel consumption rating. For example, a vehicle which consumes 7 litres per 100 km uses half the fuel of a vehicle that consumes 14 litres per 100 km. All these resources will help you compare vehicles and make an informed choice. So there it is. Here’s to you, and here’s to Auto$mart. Here’s to driving like the future depends on it. Here’s to money in the bank… and a fighting chance for this beautiful ecosphere called Earth, and this amazing country called Canada. Take the keys and remember what they represent. They represent all the learning you have done, and all the promise of a safe, skilled, and environmentally responsible future. Learn how the Auto$mart driver education program can help you teach your students about fuel efficiency and environmental responsibility while helping them to become the next generation of safe, informed Canadian drivers. 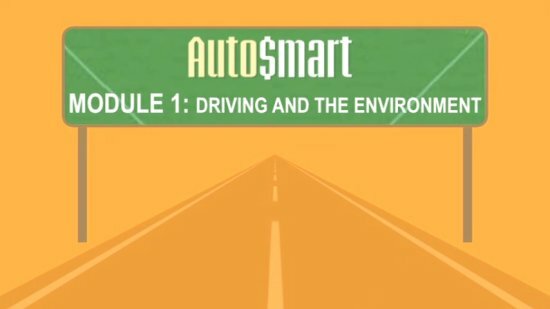 Auto$mart – a program that gives driver educators free, top-quality tools and resources so you can teach your students about fuel efficiency and environmental responsibility while teaching them to become the next generation of safe, informed Canadian drivers. By the way – thanks – right up front – from the folks at Natural Resources Canada… for taking on what we consider is a very special, very important role. And thanks for using the Auto$mart program, too. We believe it will give you and your students a real edge over other types of driver education programs. By the way – this course is fun to teach… and fun for your students to learn as well. We’ve just freshened it up with new content, and we think you will really enjoy presenting it. And know how to choose the most fuel-efficient vehicles when it’s time to consider lease or purchase. We know you are pressed for time in the classroom. That’s why Auto$mart is divided into five manageable chunks of information that work progressively toward achieving the objectives we talked about a moment ago. Module 1 is called “Driving and the Environment”, and it’s just that: you and your learners will explore the correlation between driving (and burning fossil fuels) and the health of the planet. Module 2 is called “Behind the Wheel”, and it covers five simple driving techniques students can use to cut their fuel consumption, operating costs, and environmental impact. Module 3, “The Vehicle for You”, will help your learners make wise choices when it’s time to lease or buy a new or used vehicle. Module 4, “Driving Tune-Up”, is a full review of all the lessons, and a wrap-up of the course. You can incorporate all or some of these modules into your curriculum in any order. Each session wraps with a 3-minute review of key points. Create a welcoming classroom – and have fun! Excitement is contagious, and if your learners feel welcome and involved in all aspects of the course, you will all have a great time while learning. Remember, a full instructor’s guide is in the kit. Refer to it for more information and ideas. Enjoy the course and, once again, thanks from Natural Resources Canada and the Auto$mart team.